This past weekend marked the official start of summer here in Phoenix. We are now well into the warm 100 degree weather which means we take extra precautions when dealing with the heat and with traveling with our fur family. Our dogs have to go outdoors so we are sure to have our summer pup care plan in place even when they have a dog door, and we are sure to check on their overall health during these warmer months. With being outdoors and warmer weather, that means travel for some families to escape the heat. Potential hazards arise with all these factors, dog owners should take extra precautions for summer pup care. Phoenix is a scorcher during the summer months. So the most obvious summer pup care is to ensure your dog is well hydrated. However, with hydration can bring problems. Pools are a staple to most residents of Phoenix which not only pose a threat to small children but pets as well. Keeping your pool blocked from your pet will keep them safe and healthy from drinking the chlorinated water and prevent your pet from going into the pool. Standing water can bring unfamiliar critters which could harm your pup. Arizona is home to all sorts of interesting bugs, pests, and critters including spiders, scorpions and mosquitoes, all of which pose a threat to your pet’s overall health. Warmer weather does bring out the critters, pests, and bugs so making sure that your yard is free of these will help to keep your pup healthy and happy. Some owners may not spray and keep up barricades. Be sure that your barricades and enclosures do not pose any dangers to your pet that could result in them becoming lodged or stuck or worse. Caring for your pet should always remain a priority. Summertime can result in greater risk for pets to fall ill. I know some years ago our bulldog fell victim to heat stroke because she was unwell and the heat really took its toll. Regular vet visits to ensure your pup is up to date on their shots as well as any pest protection will keep them comfortable, healthy and happy. Our Bella is a Lhasa-Poo and her hair can get a bit unruly. 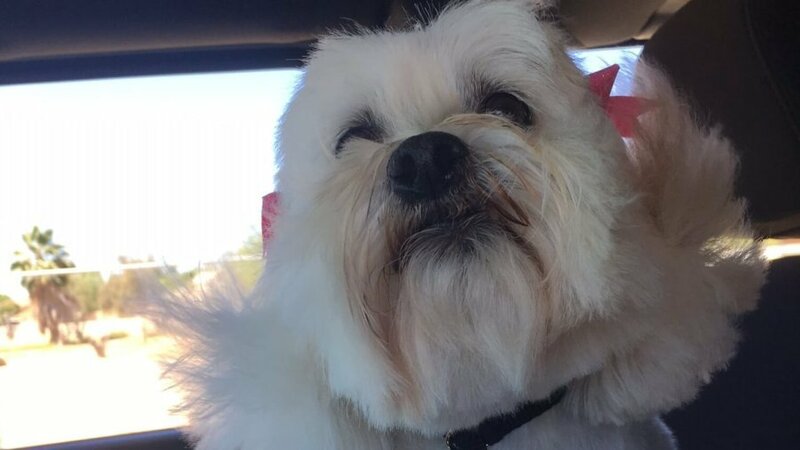 Her summer pup care often consists of regular visits to the groomer to help keep the excess hair off her and help her stay happy and cool all summer long. Finally, ensuring your pet has plenty of food and water. The warmer weather means we are on the go just a bit more so our pets may feel neglected. Making sure they have plenty of water in the warmer days and plenty to eat will ensure they are always happy and healthy. Summer travel is almost always planned for lots of families. Memorial Day kicked off our travel plans and we basically have travel scheduled, if not every weekend, then every other weekend until August. Our fur family is definitely part of any travel plans as we ensure they are cared for like our kids and we are prepared for anything. We went camping over Memorial Day weekend and had to consider the businesses we would be interacting with as well as the overall environment our dogs would be subjected to. Our camp trip consisted of range shooting within ear shot of our dogs. Firearms, like any loud and overly busy areas, may be upsetting to your pup, so avoiding these interactions are helpful to their well-being. With our travels we made sure to have all our paperwork for shot records and licensing on-hand, leashes, etc. While these are some suggestions based on our experience with caring for our pups over the summer months and throughout the year, each pet owner and geographic area can vary. Talk to your veterinarian about a summer pup care plan and how you can keep your pet healthy and happy during the warmer months. For more information about summer pup care and other doggo awesomeness visit PuppySpot, which is where we found these great tips, and to stalk some really adorable pups, check out their puppy page too!